Cream butter, herbs, zest, pepper and juice. Mound in center of plastic wrap square. Roll into cylinder, twisting the ends of plastic to seal. Put rubber bands on ends to hold the seal. Season steaks liberally, then grill to your desired doneness. 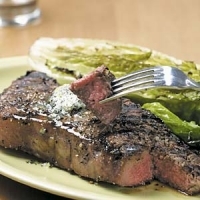 Top with 1/2" thick slice of Herb Butter and rest 3 minutes. Sounds like another 5 to me, great post. This is my hubby's favorite! Great posting!